A university study claims to have discovered the secret to player retention. Online games are nothing without a loyal following of active players. Despite all the changes the genre has been through since the dawn of Multi-User Dungeons, the biggest challenge to developers has been attaining that critical mass of dedicated gamers. A recent study from the University at Buffalo School of Management explores the age-old problem, and it has concluded that online games need to increase feelings of character ownership and player cooperation. Science says so. "Most prior research has focused on the addictive nature of these games," says Lawrence Sanders, professor and co-author of the study. "Our study looked at how to make them more competitive in the marketplace." This was done by following 173 MMORPG players and observing how different gaming strategies impacted the players' loyalty to their games. "The graphics and technology behind the games have improved over the years, but developers haven't made much effort to understand what makes MMORPG players really commit to one game over another," Sanders explains. The study focused on two strategies of player retention. The first observed that player loyalty was increased when gamers were given more control and ownership of their in-game character. Sanders advises that one way to do this is to "provide equal opportunities for any character to win a battle." 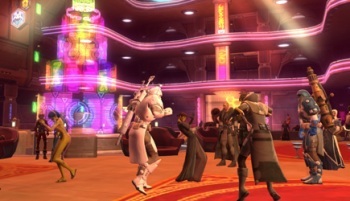 The second strategy found that cooperation between fellow players through guilds helped to increase loyalty and social identity. Sanders urges developers to "build more selective or elaborate chat rooms and guild features to help players socialize." It's no secret that online gamers are drawn to the games their friends are playing, which means that maintaining player loyalty is crucial for game developers. Sanders notes that a 5% increase in customer retention can result in an increase in profits of up to 95%. The suggestion about battlefield equality goes against traditional laws of MMO group dynamics, but Sanders may have a point. Guild Wars 2 was praised for its unconventional design. Likewise, a strong community is the reason Star Wars Galaxies still has a dedicated cult following a year after its servers closed, while The Old Republic just went free-to-play to attract more players. Game developers, take note.